Sometimes, you may want to download YouTube audio on Mac only. YouTube itself does not provide any access to download YouTube video and audio. So you need to get help from other thrid-party YouTube audio downloader for Mac. To get only the audio from YouTube, you need to consider audio quality and make the audio as good as the original file. No worry! Below we will show you 3 easy ways to download audio from YouTube on Mac in high quality. The best application to use if you want to get the best quality audio tracks is iTube Studio. 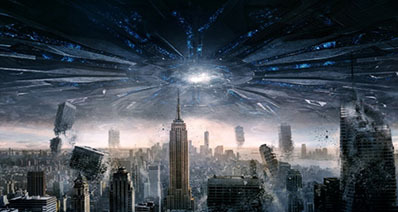 This application allows you to download YouTube videos as well as YouTube 4K UHD videos so that you can watch them on your computer safely and without interruption from ads. You can use it to download all videos from a YouTube playlist, channel and category very easily using a Download All button. Apart from allowing you to download videos from YouTube very easily, iTube Studio also supports conversion of YouTube videos to different formats, including MP3. 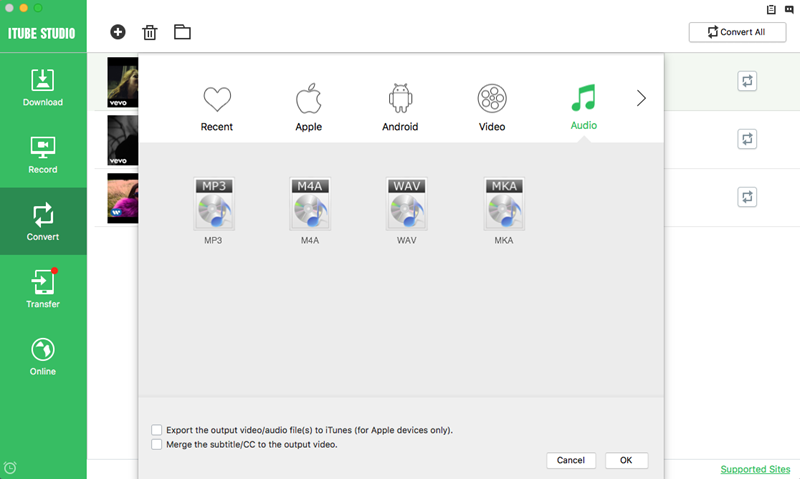 You can also use it to automatically export audio files from YouTube to iTunes. This application makes multitasking very easy by allowing you to download video files in a batch and then convert them simultaneously at a fast speed. It provides multiple resolutions for downloading videos from YouTube and other sites online, including 4K, 4K UHD, 720p, 1080p, 480p, 360p and so on. It has a Download All button that allows you to save an entire playlist, category or channel of videos from YouTube and other sites. You can use it to export downloaded videos to iTunes library directly so that you can synch then to your iPhone, iPod, or iPad. You can leave your Mac on when iTube Studio is downloading and let it shut down the computer or take it into sleep mode automatically after the download is complete. First and foremost, you will need to go to the iSkysoft website and then download this application. Save it on your Mac in a folder that you can easily trace. After the download process is complete, drag the installation file to the “Applications” folder and then wait for a few seconds for the installation process to complete. Once you have installed the program successfully, you can go ahead and launch it. Method 1: Download YouTube to MP3 in 1 Click To download YouTube audio in one click, you will need to launch your favorite browser, open YouTube.com and then search and play the video that you want to download. 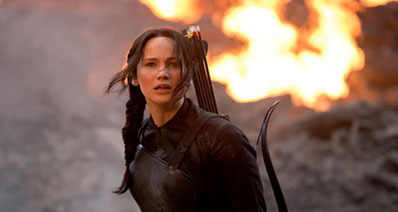 Once the video starts playing, you will see a "Download" button at the top left corner. A drop down list will be opened where you will need to choose MP3 format. Once you have done that, iTube Studio will start downloading the audio automatically. Method 2: Download and Convert YouTube Videos to Audio Format Go to YouTube.com, search for the video that you want to download and then play it. Click on the "Download" button that will appear and then allow the YouTube download wizard to record audio from YouTube Mac. After the video that has been downloaded, go to the "Downloaded" tab and then click on the "Add to Convert List" button of the right side of the video. In the "Convert" tab, click on the “Convert”, choose MP3 as your output format and then click "OK" to start the conversion. You can record YouTube audio on Mac without necessarily installing any software. 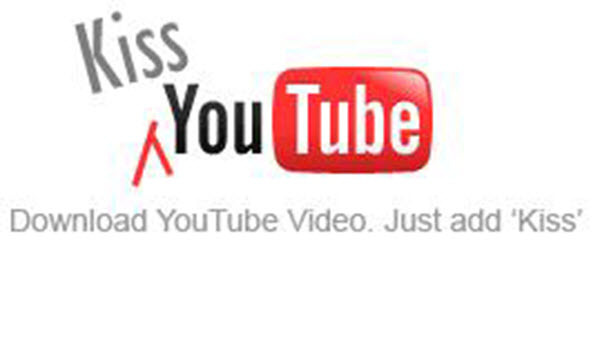 All you need to do is put a “kiss” before the “YouTube” in the URL of the video you want to download. The following is a step by step guide. Step 1: Open the YouTube video whose audio you want to download. Step 2: Change the URL of the video by adding the word “kiss” to it. For instance, if the URL of the video you want to download is www.youtube.com/watch?v=eRxHs29gRsQ, you will need to change it to “www.kissyoutube.com/watch?v=eRxHs29gRsQ”. 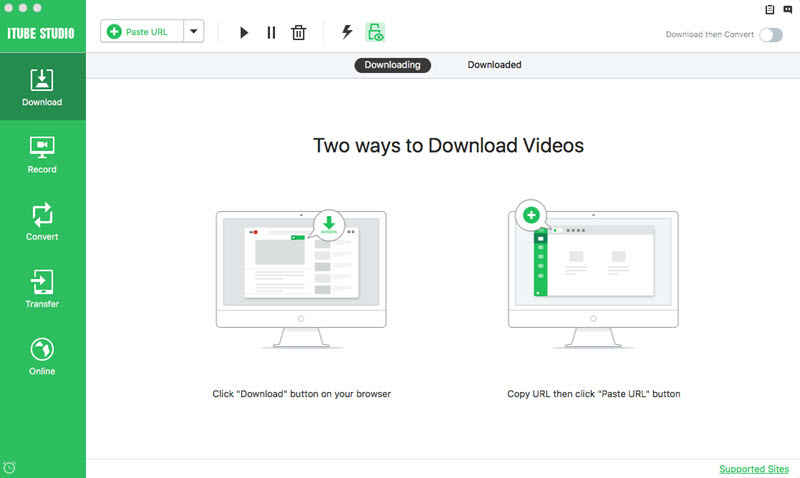 Step 4: Look for the line that represents the video you want to download and then double click on it to start the download process. Note: The browser that has been used in this case is Safari. 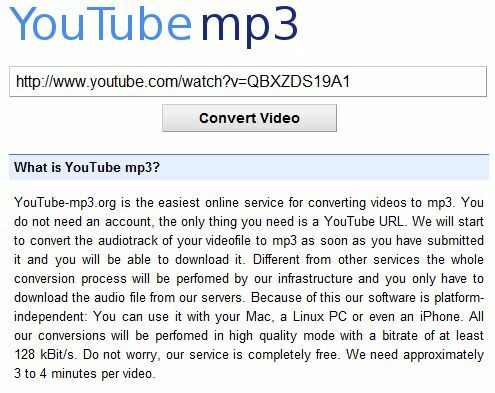 To download YouTube audio online, all you will need to do is visit youtube-mp3.org and then do the following. Step 1: Copy and paste the URL of the YouTube video that you want to convert to MP3 in the text field on that website. Step 2: After that, click on “Convert Video” so start the conversion process. Once the conversion is complete, click on “Download” to download YouTube audio.